To their credit Scheppach have quite a selection of innovative products listed in their catalogue; take the KSM2000 edge sander that we reviewed back in F&C188. I've come to accept that Scheppach machines do not always follow the conventional lines of construction. Quite often they're missing the masses of cast iron and rigid box section base cabinets that other manufacturers rely on to convey an air of solid build quality. 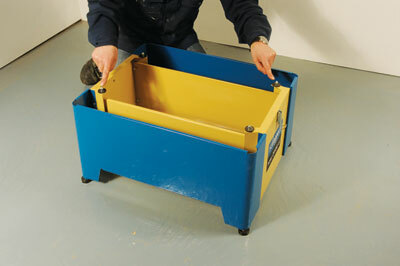 Instead they feature copious amounts of pressed steel, folded and drilled ready for self-assembly. At first glance you might be forgiven for thinking that they are a little bit, well, toy-like compared to some of the more robust kit out there. It's a fair assessment perhaps, considering the low 'body mass index' but don't be too hasty in your judgement because these machines will get the job done. The HMS2600ci planer thicknesser is classic Scheppach. The base is a self-build unit from pressed steel, which only took half an hour or so to construct, and turned out to be far more rigid than I was expecting when the top part of the machine was lowered onto it. Four steel locating dowels ensure there is no mis-alignment and spring clamps at either end hold everything in place. The fence and blade shield are partly assembled and really only require fitting into place. In all it took about an hour to get everything out of its packaging and set up to run a test piece. I'm not in the habit of sharpening the edges of tooling on machines that are supplied for review, in the same way I might dress a plane iron, so the finish we experience is close to what you can expect should you take the plunge and buy a similar unit. There were some minor adjustments to be made to both tables - not surprising considering they were used to hoist the top half of the machine in place and once done, I would fully expect them to stay set. I managed to set the tables to eliminate snipe on surface planing but it was still slightly evident when thicknessing. 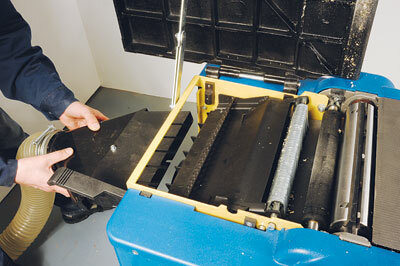 It should be quite easy to remedy this but requires removing the side casing to access the rollers. 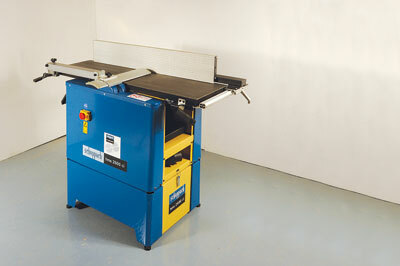 Both surface tables are made from cast iron and do not have pierced edges around the block that are designed to reduce the level of noise produced as the blades pass by. Of course, this makes little difference to the user because they'll be wearing ear defenders but co-workers perhaps might feel the benefit. The castings are a little lean and there was some minor pitting visible at the edge but not near the surface. The other critical setting for this machine is the fence and once again, although not as heavily engineered as some machines, it was still possible to set square and therefore produce accurately dimensioned stock. For the record I chose a 180mm wide board of maple (Acer campestre), which the HSS knives handled with relative ease. Common sense dictates that lighter cuts will result in better performance on less industrial rated machines and such an approach will stand you in good stead if you need a machine with a capacity that doesn't exactly match your budget. My main gripe with machines that are competing primarily on price is the quality of fittings. Cheap knobs and levers can give a poor impression unnecessarily and I seriously question the validity of a strategy to shave pennies off the bottom line when the first thing a prospective buyer will do is to grab hold of a handle. There are ways round this of course if you are willing to source upgrades and fit them yourself, and I recommend you do. 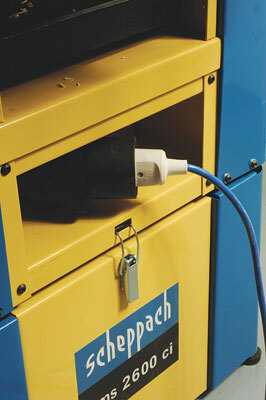 Scheppach have chosen to mount the fence directly onto a pressed steel plate running the length of the in-feed table. This component in turn adds to the surface blade guard. Lateral movement of the fence is via a fixed aluminium extrusion at the front end of the in-feed table; a feature associated with some higher spec machines. 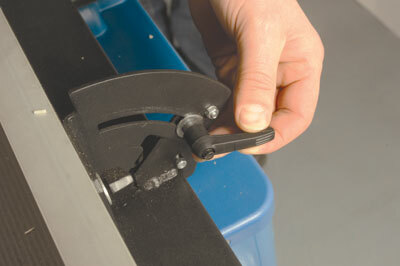 Truing the fence or adjusting for bevels couldn't be simpler. The mechanism is basic but effective. It may warrant checking more often than on a more expensive machine if you're running out meter after meter of stock, but it's not a bad habit to get into. Part of the self-assembly will require you to add the scale to the adjuster. You also have the option to replace the metric scale indicator for the thicknessing with an imperial one. When it comes to thicknessing, only the out-feed table needs raising. 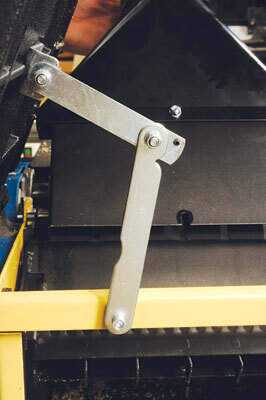 The chip collector that is mounted beneath the block comes apart and flips over to provide extraction above the table; micro switches prevent any false starts. It is a tight fit and requires a little man-handling to get it all reconnected first time round but once achieved, changing between modes is really quite quick. Although the table is not exactly heavy the stay is rather lightweight in my opinion. It does lock out but could easily be knocked causing the table to crash down. 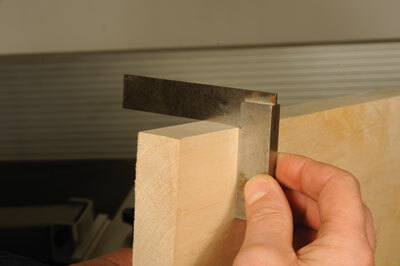 There is space to drill a small hole - say, 4mm - to insert a pin if you wanted. The table uses the four threaded spindle mechanism for rise and fall and with a feed rate of 5m/min the finish is quite acceptable. The feed rollers are rubber coated so there are no nasty indents to deal with should you want to make a really light final pass. Incidentally, the feed rollers can be disengaged when not required. There is a slight drop in noise but the benefit is one of safety and prolonged life of some of the moving parts. On some websites the HMS2600ci is being sold as a machine for professional use. It certainly meets the criteria for it to be used by an employee, but I doubt it would withstand long term exposure to the rough and tumble of a commercial workshop. That said, it is perfectly capable of producing the results expected by the discerning woodworker. If you fit this description and accept that, in the right hands, practically all machines have the potential to be precision instruments, you will not be disappointed. I did not try it but I am reliably informed that this machine will thickness down to 1mm and take lengths as short as 100mm through the machine. I have quoted the RRP below but it is available for considerably less so shop around and bag yourself a bargain. While you are at it have a look at the wheel set for this machine - Scheppach Universal Wheel Kit - and perhaps even consider a set of TCT knives.